While immigration is among the most important issues the country faces, misperceptions persist about fundamental aspects of this crucial topic—such as the size and composition of the immigrant population, how immigration affects the economy and the workforce, the budgetary impact of unauthorized immigration, why increasing numbers of unaccompanied migrant children are arriving at the United States’ Southwest border, and the various facets of U.S. labor migration policy. This FAQ provides essential background on these topics. 1. How many immigrants reside in the United States? 2. How many unauthorized immigrants are in the United States? 3. Are most immigrants Hispanic/Latino? When it comes to unauthorized immigrants, the overwhelming majority are indeed Latino—primarily from Mexico and Central America. 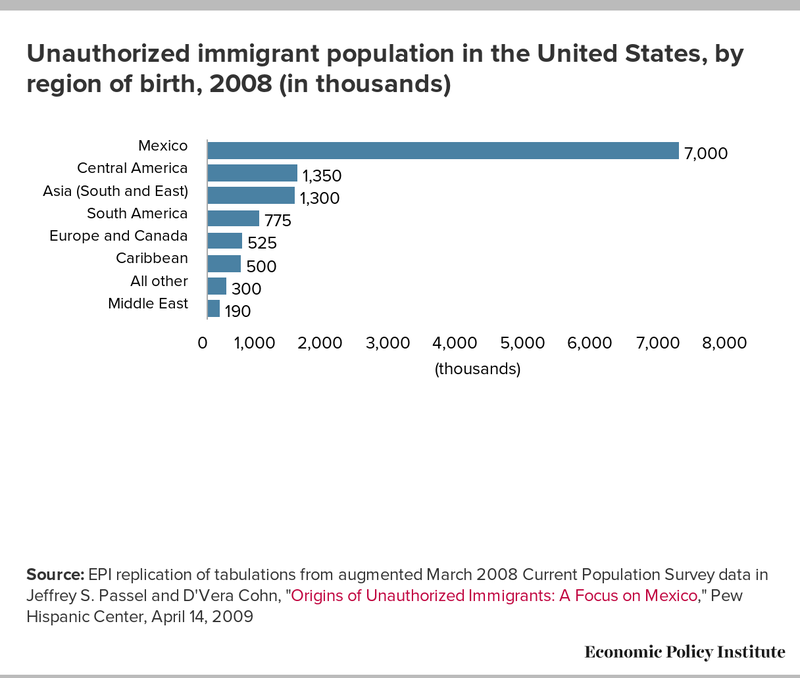 There are, however, also populations of unauthorized immigrants from Asia, South America, Europe and Canada, and the Caribbean (as shown in Figure A). 4. How much do immigrants contribute to the economy? One way to quantify immigrants’ contribution to the U.S. economy is to look at the wages and salaries they earn, as well as the income of immigrant-owned businesses, as a share of all wages, salaries, and business income in the United States. (See Table 1.) For the United States as a whole, immigrants’ share of total output was about 14.7 percent over 2009–2011. Note that this is actually larger than immigrants’ 13 percent share of the population. Note: All figures are in 2011 dollars. Economic output is derived from wages and salary and proprietors' income. 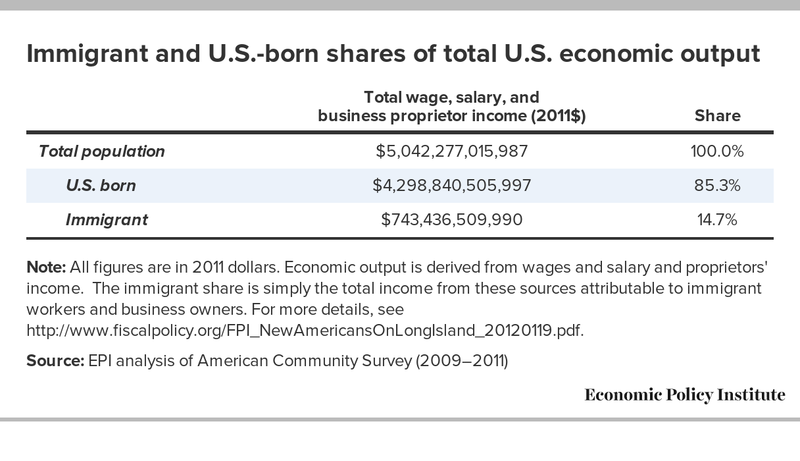 The immigrant share is simply the total income from these sources attributable to immigrant workers and business owners. For more details, see http://www.fiscalpolicy.org/FPI_NewAmericansOnLongIsland_20120119.pdf. 5. Are most immigrants employed in low-wage jobs? In the United States as a whole, there are almost as many immigrants in white-collar jobs (46 percent) as in all other occupations combined. In some states, more than half are in white-collar jobs.7 However, not all white-collar jobs pay well, and the share of U.S.-born workers in white-collar jobs is even higher. Still, the perception that nearly all immigrants work in low-wage jobs is clearly inaccurate. Immigrants may be overrepresented in some jobs and underrepresented in others, but the difference between the U.S.- and foreign-born shares is rarely as dramatic as is often assumed. Immigrants are strongly represented in some high-wage jobs, and play a significant role in many middle-wage jobs. For example, 22 percent of dental, nursing, and health aides are immigrants, as are 31 percent of computer software developers—well above immigrants’ 16 percent share of the labor force.9 While immigrants are overrepresented in low-wage occupations, immigrants are a part of the top, middle, and bottom of the economic ladder. 6. Are most immigrants poor? Nationally, and in many states, the income of immigrant families is not very different from that of non-immigrant families, although individual earnings are lower for immigrants overall. This is because there are typically more workers per immigrant family. 7. Do immigrants take jobs away from American workers? There is broad agreement among academic economists that in the long run, immigration has a small but positive impact on the labor market outcomes of native-born workers, on average.11 There is some debate about whether, within the overall small positive effect, certain subgroups are harmed, in particular native-born workers with low levels of education. The United States could benefit enormously from an immigration system that is more responsive to broader economic conditions. In our current immigration system, legal immigrant flows are essentially unresponsive to the business cycle. In particular, Congress has set a yearly limit on the number of new permanent and temporary immigrants who may enter the country legally in order to work, and these limits do not fluctuate based on the state of the labor market. For example, in 2010, the unemployment rate in construction was over 20 percent, but the Department of Labor nevertheless certified thousands of temporary foreign worker visas for the construction industry. An independent federal agency should be established to evaluate the U.S. labor market and make annual recommendations to Congress on the levels of permanent and temporary immigrant labor. This would better allow the U.S. economy to respond to the needs of employers during expansions while avoiding adding too many additional workers to the labor market when the unemployment rate is high. 8. Does immigration depress wages for American workers? The most rigorous work on the effect of immigration on wages finds extremely modest effects for native-born workers, including those with low levels of education. Table 2 is from a paper showing immigration’s relative impact on wages from 1994 to 2007 by gender and education for both U.S.-born and foreign-born workers.13 The first three columns show the impact on native-born workers by gender and education, and the next three columns show the impact on earlier immigrants by gender and education. Note: The different sets ("low," "high," and "typical") reflect the fact that for each relevant elasticity (the effect on wages from an increase in immigration), there is a range of estimates in the labor literature. The column “low” assumes that the substitutability of workers in different education categories is at the low end of the range, and that the substitutability of natives and immigrants within the same education/experience class is at the high end of the range, both of which will give the gloomiest outlook for the effect of immigration on the wages of natives with low levels of schooling. 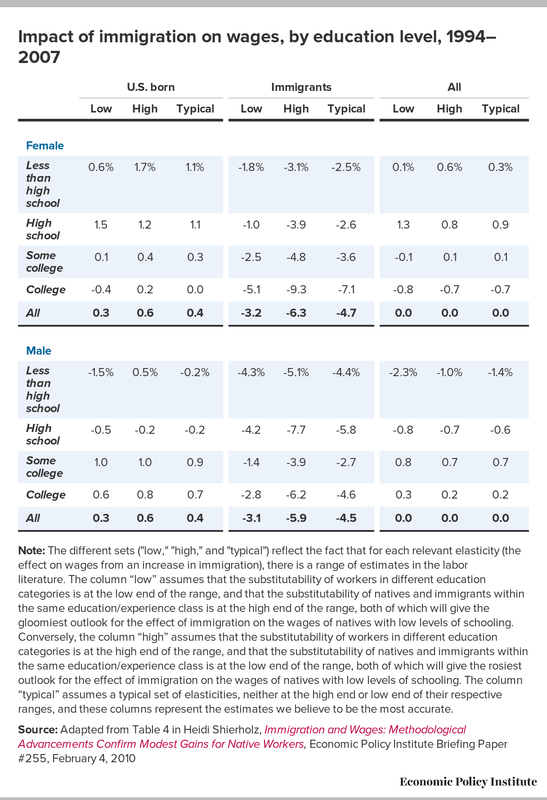 Conversely, the column “high” assumes that the substitutability of workers in different education categories is at the high end of the range, and that the substitutability of natives and immigrants within the same education/experience class is at the low end of the range, both of which will give the rosiest outlook for the effect of immigration on the wages of natives with low levels of schooling. The column “typical” assumes a typical set of elasticities, neither at the high end or low end of their respective ranges, and these columns represent the estimates we believe to be the most accurate. The salient point here is that earlier immigrants are the group that is most adversely affected by new immigration. This is because they are often the most substitutable for new immigrants, often living in the same places and possessing similar skills. But for native-born workers, the effects tend to be very small, and on average, modestly positive.14 This is useful for reminding policymakers that native-born workers have little to fear as far as immigration’s labor market impact is concerned. And to the extent there is something to fear, it stems from not providing legal status to unauthorized immigrants, and from guestworker programs where workers have limited rights and are tied to one employer. A useful framework for thinking about this is that any situation where workers’ individual bargaining power is reduced is going to put downward pressure on their wages, and therefore also on the wages of workers in similar occupations and industries. For example, temporary foreign workers (also commonly referred to as “guestworkers”) who don’t have the legal right to change employers have greatly reduced bargaining power; if their employer treats them badly their only recourse is to leave the country, and many incurred a great deal of debt to get here. Additionally, “prevailing” wage rules in guestworker programs often allow guestworkers’ employers to pay them a lower wage than the market rate. In short, these workers’ lack of bargaining power—their weak position—puts downward pressure on the wages and working conditions of native- and foreign-born workers alike in the occupations and in the places where guestworkers are present. For unauthorized immigrants it’s a similar story: They have essentially no bargaining power and virtually no labor or employment rights. If they complain about workplace safety violations or being paid less than the minimum wage, for example, an employer can fire them or threaten them with deportation. That puts downward pressure on the wages and working conditions of workers—both native- and foreign-born—in the occupations and in the places where unauthorized workers are present. Bringing these workers out of the shadows will be better not just for the workers themselves, but also those native-born workers who are similarly situated. 9. Do unauthorized immigrants increase budget costs for states or the federal government? There is a fairly broad consensus that the present value of the long-run net fiscal impact of unauthorized immigration, at all levels of government combined, is small but positive—meaning that immigration reduces overall budget deficits.15 The long-run fiscal impact at the federal level is strongly positive; however, the impact at the state and local levels is negative. There is also a clear understanding that while the negative state and local impacts are largely concentrated in the states and localities that receive most of the new immigrants, the federal impact is shared evenly across the nation. Unauthorized immigrants are also unlikely to receive any income credits available through the tax code, or to receive a tax refund if they overpaid in their regular payroll withholdings. The Tax Policy Center estimates that 78 percent of American households that earned less than $33,000 owed no federal income taxes in 2011.19 Many low-income taxpayers only paid marginal amounts if they did owe. Because of their low income levels, most unauthorized immigrants would likely fall into either of these categories. A significant portion of unauthorized immigrants file taxes using Individual Taxpayer Identification Numbers (ITINs);20 however, many unauthorized immigrants don’t file because they fear deportation. If they don’t file, they are never refunded money that was automatically withheld from their paychecks. 10. Do unauthorized immigrants use public support programs like welfare, unemployment insurance, and food stamps? While it is possible that an unauthorized immigrant could benefit from a U.S. citizen or legal permanent resident family member receiving income support through a federal or state program, unauthorized immigrants themselves by and large are ineligible for such programs because of their immigration status. 11. Couldn’t we just deport the 11.7 million unauthorized immigrants? Aside from the astronomical costs it would impose21 and the fact that it’s likely to be a logistical impossibility, it would actually hurt, not help, the economy and the jobs situation. The key intuition here is that while unauthorized immigrant workers add to the supply of labor, they also consume goods and services, thereby generating economic activity and creating jobs. One way to think of this is to remember that the labor force is growing all the time due to both immigration and native-born population growth, and that’s okay, because the economy expands too. We all understand this intuitively; that’s why we don’t worry when a new graduate enters the labor force. We know those new graduates buy food and cars and clothes and pay rent. By the same token, unauthorized immigrants are not just workers, they are also consumers. We could remove them, which would indeed reduce the number of workers, but it would also reduce the jobs created by the economic activity they generate. So the right choice is to bring the unauthorized immigrants who are already here out of the shadows so they can help the country realize its economic potential. 12. Should we wait until the economy has recovered before regularizing the unauthorized immigrant population? No, this is precisely the time we should regularize the country’s 11.7 million unauthorized immigrants by providing them legal status and a path to citizenship; it would actually be good for the economy and generate jobs. Providing legal status and citizenship enables unauthorized immigrants to produce and earn significantly more than they do when they are working without legal rights or protections and in constant fear of deportation. Their resulting productivity and wage gains ripple through the economy because immigrants are not just workers—they are also consumers and taxpayers. In particular, they will spend their increased earnings on items like food, clothing, housing, cars, and computers. That spending, in turn, will stimulate demand for more goods and services, which will create the need for more workers. In other words, it will create jobs. 13. Why are tens of thousands of unaccompanied migrant children from Central America showing up on the Southwest U.S. border? 14. 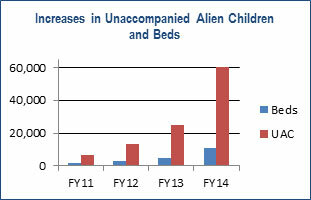 How many unaccompanied migrant children have arrived from Central America and Mexico in the past few years? Since 2011, a rapidly increasing number of unauthorized unaccompanied migrant children from El Salvador, Guatemala, and Honduras have arrived at the Southwest U.S. border and been apprehended by the Border Patrol. As shown in Table 3, between October 2013 and June 2014, approximately 39,000 arrived.26 The total from these three countries has doubled each year since 2011. If Mexico is included in the total so far for fiscal 2014, the number of UACs apprehended is over 51,000 (although the number of Mexican UACs arriving has not been increasing over the same period). * Data for fiscal 2014 are through June 15. 15. Is the United States the only country that Salvadorians, Guatemalans, and Hondurans are fleeing to? No, the increased inflow of Central Americans from Northern Triangle countries is not unique to the United States. Between 2009 and 2013, Mexico, Panama, Nicaragua, Costa Rica, and Belize collectively saw a 712 percent increase in the number of asylum claims filed by nationals of El Salvador, Guatemala, and Honduras.27 This is strong evidence that—apart from the false rumors of relaxed treatment in the United States—people are desperate to escape these countries, and are seeking protection throughout the region. 16. Does the arrival of unaccompanied migrant children mean the U.S. border is not secure? 17. What happens to these unaccompanied migrant children? Do we just send them home? Under a 2008 anti–human trafficking law, unaccompanied migrant children who are apprehended at the border are treated differently depending on whether they are from a country that is contiguous to the United States. UACs from Canada and Mexico may be removed without a hearing in immigration court, after a determination by a Customs and Border Protection officer. However, those from countries other than Canada and Mexico are turned over to the Department of Health and Human Services within 72 hours and put into standard deportation proceedings, which include a hearing before an immigration judge. While the law allows any person with a case before the immigration court to be represented by an attorney, the law does not require that all unaccompanied children have an attorney in court, nor does the law provide the funding to pay for an attorney. As a result, while unaccompanied migrant children are provided with advice from an advocate, only some receive legal representation, either from an attorney providing services pro bono, or because the child (or someone paying on his or her behalf) can afford an attorney. Many children are left with no choice but to represent themselves at their own deportation hearings. A judge then determines whether the child is entitled to some form of immigration relief, including a T visa (for victims of trafficking), U visa (for victims of certain crimes), the granting of asylum, or Special Immigrant Juvenile status (which leads to permanent residence). But if the child is not found to be eligible for any U.S. immigration status or deferred action, the child may be removed to his or her country of origin. 18. Is the U.S. immigration system equipped to handle the increased flow of unaccompanied migrant children? Two aspects of the U.S. immigration system have been exposed as ill-equipped to manage the increase in unaccompanied migrant children. Second, U.S. immigration courts are also proving to be inadequate, underfunded, and understaffed. The immigration court system only employs 243 immigration judges, while currently having a backlog of 375,500 cases.32 As a result, the average wait time for a hearing in immigration court is 587 days.33 Central American UACs are entitled to a hearing in immigration court under U.S. law to determine whether they qualify for an immigration status or if they will be repatriated to their home country, which can result in UACs residing in the United States for years before their cases are resolved. The Obama administration has indicated that UAC hearings will now be moved to the front of the line,34 which is helpful for individual UACs but does not remedy the shortage of immigration judges or the long wait times for other immigrants awaiting a hearing in immigration court. The court system also does not have funds to provide every UAC with legal counsel and representation during court proceedings, nor does the law require it. 19. Which legal routes are available to immigrants seeking to work in the United States? Foreign-born workers may enter the United States for work through a number of temporary and permanent visa programs. Temporary visas are also known as “nonimmigrant” visas, many of which grant the worker legal status and work authorization for a set period of time and usually for a specific employer, and none of which automatically lead to permanent residence and naturalization (citizenship). “Employment-based” immigrant visas, on the other hand, grant the worker legal permanent resident (LPR) status, and in most cases a U.S. employer must petition for the visa on behalf of the worker. An employment-based immigrant visa holder can obtain citizenship after remaining in LPR status for 5 years and meeting certain other requirements. Foreign-born persons who enter the United States lawfully after being granted an immigrant visa by virtue of being granted refugee status, a diversity (lottery) visa, or because of a family relationship they have with a U.S. citizen or legal permanent resident, may also seek employment and be hired with almost any employer (except for positions that require citizenship; for example, certain positions that require a high level of security clearance). Although these categories of immigrant visas permit employment, they are not considered to be “employment-based” visas because the foreign-born worker is not coming to the United States to work in a particular position for a specified employer, nor do they fall under the annual numerical limitations on employment-based visas. 20. 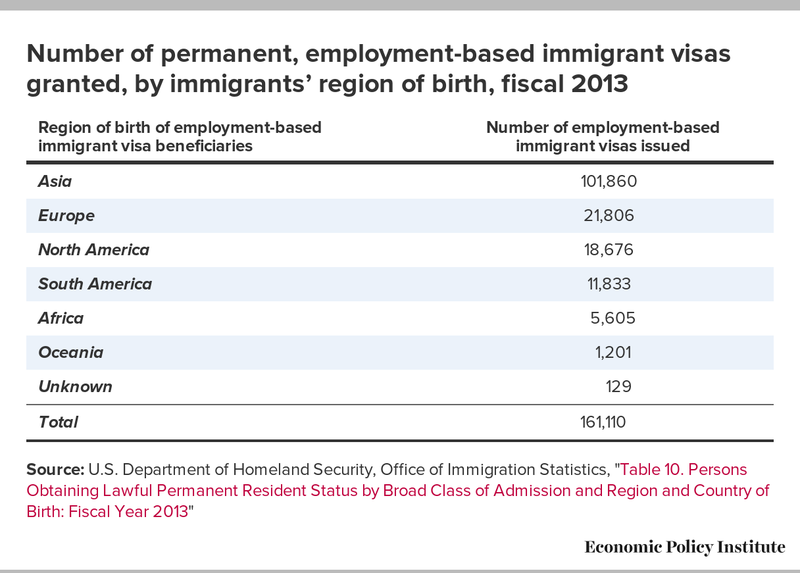 What are the different classifications of employment-based (EB) immigrant visas? 21. What are the annual numerical limits on EB immigrant visas? There are also per-country numerical limits. No more than 7 percent of the total of EB immigrants in a fiscal year may originate from any single country. This limit is designed to preserve diversity among incoming immigrants by preventing any particular immigrant group from dominating the annual flow of immigrants. In addition, it is important to note that immediate family members (spouses and children) of principal EB immigrants who are granted an immigrant visa count against the numerical limits in the EB category. This means that every year approximately half of EB immigrant visas are issued to the family members of principal EB immigrants. 22. What are the different classifications of nonimmigrant visas that permit employment in the United States? According to the Congressional Research Service, the United States currently has “24 major nonimmigrant visa categories, and 87 specific types of nonimmigrant visas.”36 Many, but not all, classifications permit the nonimmigrant beneficiary to be employed. Some are known as traditional work visas, especially those in the “H” category, some of which (but not all) require that an employer first attest or certify that there are no available U.S. workers. TN visas (for Canadian and Mexican professionals) and L-1 visas (for intracompany transfers, specifically managers, executives, and employees with “specialized knowledge”) are also typical work visas, but do not require any form of labor certification or attestation. Other visa classifications permit employment but may be granted ostensibly for another purpose (for instance, for university-level studies or to facilitate an international cultural exchange). Table 4 displays some of the most common nonimmigrant visa classifications that permit employment, along with a general description and examples of typical occupations under each. 23. What are the annual numerical limits and periods of stay that are allowed on the major nonimmigrant visa classifications that permit employment? Only a few nonimmigrant visa classifications that permit employment have annual numerical limits set by law. The ones that do are all in the H category. The Summer Work Travel program, one of the (out of approximately 15 total) programs in the J-1 visa Exchange Visitor Program, has an annual limit under a regulation promulgated by the State Department. Each visa classification, because it is temporary, only permits the beneficiary to remain in the United States for a determined period of time, which is set out in law or regulation. 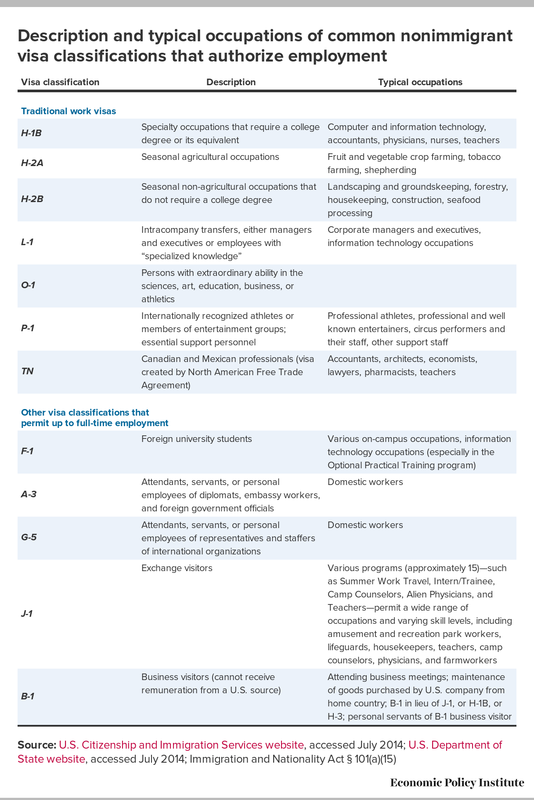 Listed in Table 5 are some of the most common nonimmigrant visa classifications that permit employment, with the corresponding annual numerical limit (where applicable), the number of visas that were granted in fiscal 2013, and the period of stay in the United States that each visa classification authorizes. No annual limit 1,135 Initially valid for up to three years, and may be extended in two-year increments. However, Department of State practice is to issue for a maximum period of 24 months, and the visa is renewable. Overall, length of stay may not exceed that of the employer. No annual limit 736 Initially valid for up to three years, and may be extended in two-year increments. However, Department of State practice is to issue for a maximum period of 24 months, and the visa is renewable. Overall, length of stay may not exceed that of the employer. 24. Are employers required to pay temporary foreign workers the minimum wage? Regardless of employees’ immigration status, employers must abide by the rules set out in the Fair Labor Standards Act (and its implementing regulations), which include the federal minimum wage and overtime pay requirements for most workers in the United States, as well as any applicable state and local wage and hour laws. However, some occupations filled by temporary foreign workers are exempt from the state or federal minimum wage (for example, if they work for an amusement park that is only open seasonally). Three programs in the H category require employers to pay a “prevailing” or “adverse effect” wage rate. This is because under U.S. laws and regulations, the wages and working conditions of foreign workers in these programs are prohibited from adversely affecting the wages and working conditions of U.S. workers. Nevertheless, it should be noted that in practice, in some cases prevailing wage rules may result in allowing employers to pay their temporary foreign workers less than the true market rate. In the H-1B and H-2B programs (which concern, respectively, specialty occupations that require a college degree or its equivalent, and seasonal nonagricultural occupations not requiring a college degree), Department of Labor and Department of Homeland Security regulations set out the rules for the prevailing wage levels. The H-2B program currently requires that the average wage in the occupation and local area be paid to the worker (unless a collective bargaining agreement applies), while the H-1B program sets four wage levels that are intended to correspond with each foreign worker’s education and experience. The required wage levels are based on Occupational Employment Statistics survey data published by the Bureau of Labor Statistics (with an exception being in the H-2B program, where employers may instead have an alternate wage approved based on a privately conducted wage survey). 25. Can temporary foreign workers switch employers? In most cases, temporary foreign workers cannot switch to another employer while retaining a valid visa status. This is because the employer petitions the U.S. government for the visa that is granted to the foreign worker; in that sense, the employer controls or “owns” the visa. In most visa programs, if a temporary foreign worker is fired from his or her job before he or she can obtain another valid visa status under a different classification or a new visa in the same classification, the worker becomes removable from the United States (this is especially true in the H visa programs). There are some classifications where a temporary foreign worker may switch employers. These include the H-1B visa (for those in specialty occupations requiring a college degree or its equivalent), the Optional Practical Training program (for foreign university students with F-1 visas), and the J-1 visa (for exchange visitors). However, doing so requires a new employer and preapproval from the government (or a sponsor agency in the case of J-1 exchange visitors). Some nonimmigrant visa classifications, for example the L-2 and J-2 (for spouses of L-1 intracompany transferees and J-1 exchange visitors, respectively), may be employed without being tied to a particular employer. 26. 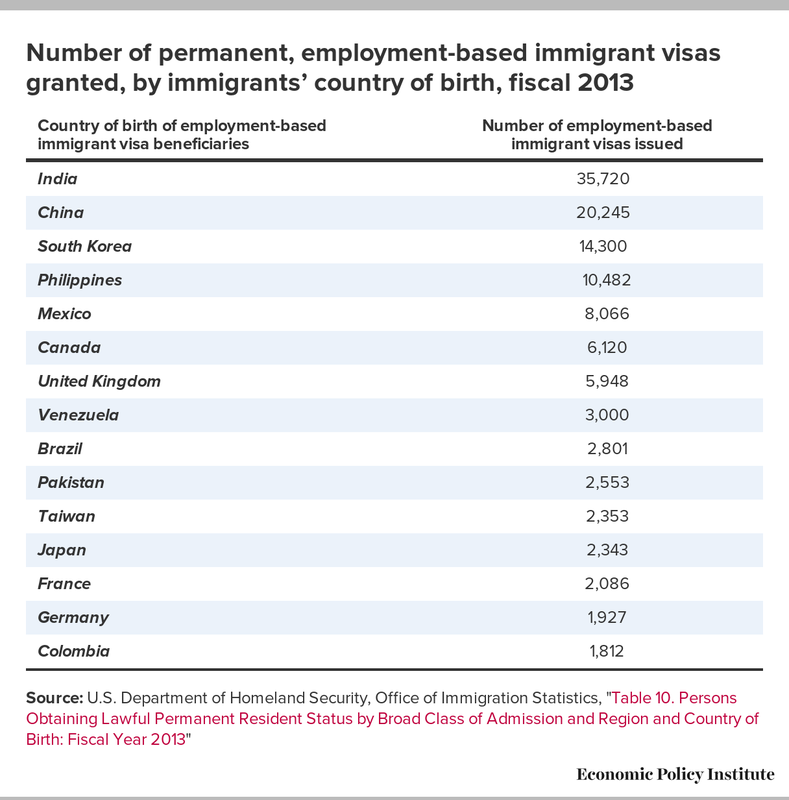 Which regions and countries do permanent immigrant workers come from? In fiscal 2013, a majority of immigrants receiving lawful permanent resident status in the employment-based (EB) preference categories came from Asia, followed by Europe, North America, South America, Africa, and Oceania, as shown in Table 6. Source: U.S. Department of Homeland Security, Office of Immigration Statistics, "Table 10. Persons Obtaining Lawful Permanent Resident Status by Broad Class of Admission and Region and Country of Birth: Fiscal Year 2013"
In fiscal 2013, the top country of birth for immigrants receiving lawful permanent resident status in the employment-based preference categories was India, followed by China, South Korea, the Philippines, and Mexico. The top 15 countries of birth of EB immigrant visa beneficiaries in 2013 are listed in Table 7. 27. Which regions and countries do temporary foreign workers come from? Daniel Costa has been EPI’s director of immigration law and policy research since 2013, having joined EPI in 2010 as an immigration policy analyst. An attorney, his current areas of research include a wide range of labor migration issues, including the management of temporary foreign worker programs, both high- and less-skilled migration, and immigrant workers’ rights. He has an LL.M. in international and comparative law from Georgetown University Law Center and a J.D. in international law from Syracuse University. David Cooper is an economic analyst with the Economic Policy Institute. He conducts national and state-level research on a variety of issues, including the minimum wage, employment and unemployment, poverty, and wage and income trends. He also provides support to the Economic Analysis and Research Network (EARN) on data-related inquiries and quantitative analyses. David has been interviewed and cited by local and national media for his research on the minimum wage, poverty, and U.S. economic trends. His graduate research focused on international development policy and intergenerational social mobility. He holds a Master of Public Policy degree from Georgetown University. 1. U.S. Census Bureau, American Community Survey, “Table DP02: Selected Social Characteristics in the United States,” 2012. 2. U.S. Census Bureau, American Community Survey, “Table DP02: Selected Social Characteristics in the United States,” 2012. 3. Jeffrey S. Passel, D’Vera Cohn, and Ana Gonzalez-Barrera, “Population Decline of Unauthorized Immigrants Stalls, May Have Reversed,” Pew Hispanic Trends Project, September 23, 2013, http://www.pewhispanic.org/2013/09/23/population-decline-of-unauthorized-immigrants-stalls-may-have-reversed/. 4. Pew Research Center, “Unauthorized Immigrants: How Pew Research Counts Them and What We Know About Them,” April 17, 2013, http://www.pewresearch.org/2013/04/17/unauthorized-immigrants-how-pew-research-counts-them-and-what-we-know-about-them/. 5. EPI analysis of American Community Survey microdata, pooled sample 2009–2011. 6. EPI analysis of American Community Survey microdata, 2011. 7. EPI analysis of American Community Survey microdata, pooled sample 2007–2011. 8. EPI analysis of American Community Survey microdata, pooled sample 2009–2011. 9. EPI analysis of American Community Survey microdata, pooled sample 2007–2011. 10. EPI analysis of American Community Survey microdata, 2011. Note that poverty rates derived from the American Community Survey are different than the official poverty rate calculated using the Current Population Survey. 11. Adam Looney and Michael Greenstone, “What Immigration Means for U.S. Employment and Wages,” The Hamilton Project, May 2012, http://www.hamiltonproject.org/papers/what_immigration_means_for_u.s._employment_and_wages/. 12. See Giovanni Peri, The Impact of Immigrants in Recession and Economic Expansion, Migration Policy Institute, June 2010, http://www.migrationpolicy.org/research/impact-immigrants-recession-and-economic-expansion; and David Card, “Is the New Immigration Really So Bad?,” NBER Working Paper No. 11547, August 2005, http://www.nber.org/papers/w11547. 13. Heidi Shierholz, Immigration and Wages: Methodological Advancements Confirm Modest Gains for Native Workers, EPI Briefing Paper No. 255, February 4, 2010, http://www.epi.org/publication/bp255/. 14. Heidi Shierholz, Immigration and Wages: Methodological Advancements Confirm Modest Gains for Native Workers, EPI Briefing Paper No. 255, February 4, 2010, http://www.epi.org/publication/bp255/. 15. National Resource Council, “The Future Fiscal Impacts of Current Immigrants,” Chapter 7 in James P. Smith and Barry Edmonston [editors], The New Americans, National Academy Press, Washington, D.C., 1997, http://isites.harvard.edu/fs/docs/icb.topic803549.files/Week%209-November%203/Smith_Future.pdf. 16. Jordan Rau, “Immigrants Contribute More To Medicare Than They Take Out, Study Finds,” Kaiser Health News, May 29, 2013, http://www.kaiserhealthnews.org/Stories/2013/May/29/immigrants-Medicare-health-costs.aspx. 17. Eduardo Porter, “Illegal Immigrants Are Bolstering Social Security With Billions,” New York Times, April 5, 2005, http://www.nytimes.com/2005/04/05/business/05immigration.html?pagewanted=1&_r=3&. 18. Eduardo Porter, “Illegal Immigrants Are Bolstering Social Security With Billions,” New York Times, April 5, 2005, http://www.nytimes.com/2005/04/05/business/05immigration.html?pagewanted=1&_r=3&. 19. Tax Policy Center, “T11-0176 – Baseline Distribution of Tax Units with No Income Tax Liability by Cash Income Percentile; Current Law, 2011,” July 13, 2011, http://www.taxpolicycenter.org/numbers/displayatab.cfm?DocID=3057. 20. Nina Bernstein, “Tax Returns Rise for Immigrants in U.S. Illegally,” New York Times, April 16, 2007, http://www.nytimes.com/2007/04/16/nyregion/16immig.html?pagewanted=print. 21. Marshall Fitz, Gebe Martinez, and Madura Wijewardena, The Costs of Mass Deportation Impractical, Expensive, and Ineffective, Center for American Progress, March 19, 2010, http://www.americanprogress.org/issues/immigration/report/2010/03/19/7470/the-costs-of-mass-deportation/. 22. Tom K. Wong, “Statistical Analysis Shows that Violence, Not Deferred Action, Is Behind the Surge of Unaccompanied Children Crossing the Border,” Center for American Progress, July 8, 2014, http://www.americanprogress.org/issues/immigration/news/2014/07/08/93370/statistical-analysis-shows-that-violence-not-deferred-action-is-behind-the-surge-of-unaccompanied-children-crossing-the-border/. 23. ACAPS, Other Situations of Violence in the Northern Triangle of Central America, May 2014, http://acaps.org/en/news/other-situations-of-violence-in-the-northern-triangle-of-central-america/1. 24. Frances Robles, “Fleeing Gangs, Children Head to U.S. Border,” New York Times, July 9, 2014, http://www.nytimes.com/2014/07/10/world/americas/fleeing-gangs-children-head-to-us-border.html. 25. David Rogers, “Flood of Child Migrants a Neglected Challenge,” Politico, May 28, 2014, http://www.politico.com/story/2014/05/flood-of-child-migrants-a-neglected-challenge-107198.html. 26. 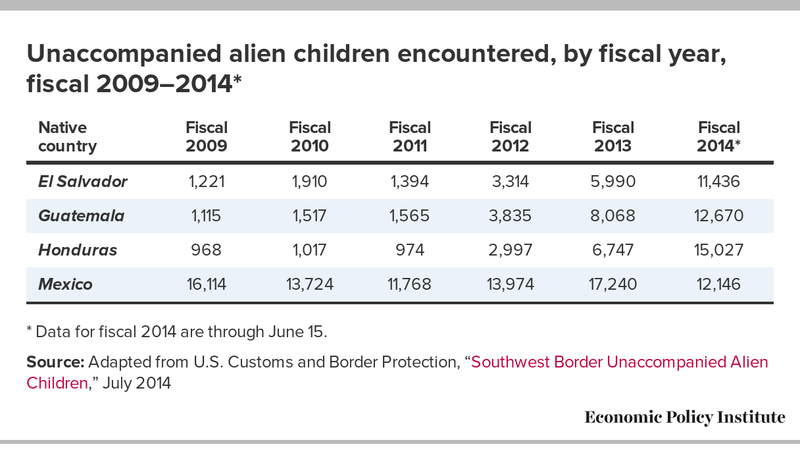 U.S. Customs and Border Protection, “Southwest Border Unaccompanied Alien Children,” July 2014, http://www.cbp.gov/newsroom/stats/southwest-border-unaccompanied-children. 27. Washington Office on Latin America, “Three Myths about Central American Migration to the United States,” June 10, 2014, http://www.wola.org/commentary/3_myths_about_central_american_migration_to_the_us. 29. Dara Lind, “14 Facts that Help Explain America’s Child-Migrant Crisis,” Vox, July 16, 2014, http://www.vox.com/2014/6/16/5813406/explain-child-migrant-crisis-central-america-unaccompanied-children-immigrants-daca/in/5577523. 30. Dara Lind, “14 Facts that Help Explain America’s Child-Migrant Crisis,” Vox, July 16, 2014, http://www.vox.com/2014/6/16/5813406/explain-child-migrant-crisis-central-america-unaccompanied-children-immigrants-daca/in/5577523. 31. Jenna Johnson, “Graffiti on Proposed Shelter for Immigrant Children in Maryland: ‘No Illeagles Here,’” Washington Post, July 14, 2014, http://www.washingtonpost.com/local/md-politics/graffiti-on-proposed-shelter-for-immigrant-children-in-maryland-no-illeagles-here/2014/07/14/cc89610a-0b89-11e4-b8e5-d0de80767fc2_story.html. 32. TRAC, “Backlog of Pending Cases in Immigration Courts as of June 2014,” June 2014, http://trac.syr.edu/phptools/immigration/court_backlog/apprep_backlog.php. 33. TRAC, “Average Time Pending Cases Have Been Waiting in Immigration Courts as of June 2014,” June 2014, http://trac.syr.edu/phptools/immigration/court_backlog/apprep_backlog_avgdays.php. 34. Julia Preston, “U.S. Adjusts Court Flow to Meet Rise in Migrants,” New York Times, July 8, 2014, http://www.nytimes.com/2014/07/09/us/us-adjusts-court-flow-to-meet-rise-in-migrants.html. 35. U.S. Citizenship and Immigration Services, “EB-5 Immigrant Investor,” July 3, 2012, http://www.uscis.gov/working-united-states/permanent-workers/employment-based-immigration-fifth-preference-eb-5/eb-5-immigrant-investor. 36. Ruth Ellen Wasem, “U.S. Immigration Policy on Temporary Admissions,” Congressional Research Service, February 28, 2011, http://fas.org/sgp/crs/homesec/RL31381.pdf. 37. Farmworker Justice, “Adverse Effect Wage Rate Rule,” n.d., https://www.farmworkerjustice.org/sites/default/files/AEWR%20Fact%20Sheet.pdf. 38. U.S. Department of State, “Nonimmigrant Visa Statistics,” n.d., http://travel.state.gov/content/visas/english/law-and-policy/statistics/non-immigrant-visas.html. 39. U.S. Department of State, “Nonimmigrant Visa Statistics,” n.d., http://travel.state.gov/content/visas/english/law-and-policy/statistics/non-immigrant-visas.html. This resource also allows you to see how many temporary foreign workers came to the United States, by visa classification and sending country.